In the absence of gravity, scientists can do experiments in the physical sciences that are difficult or even impossible on the ground. The loss of buoyancy-driven convection in a microgravity environment allows the study of underlying phenomena in fundamental fluid physics and materials science. Combustion studies in space may enable increased efficiency in power generation and propulsion on the ground as well as improve fire safety. Microgravity-enabled material production capabilities and advanced manufacturing facilities demonstrate scientific and commercial merit for Earth benefit. Commercial applications of spaceflight R&D in physical sciences include manufacturing, alloy development, energy transfer, biomedical advancements, and advanced materials testing. Our quest to understand gravity (and the phenomena that depend on it) began in ancient times. Archimedes, a prominent Greek scientist of the ancient world, supposedly ran through the streets of Syracuse shouting, “Eureka!” when he first discovered the nature of buoyancy. More than 2,000 years later, buoyancy is just one of many phenomena that behave differently in a microgravity (weightless) environment, allowing modern scientists to do unique research onboard the ISS National Lab to advance materials science breakthroughs and improve our fundamental understanding of fluid behavior. Fluid dynamics: Buoyancy, a major cause of convection (the movement of molecules within a fluid), depends on gravity and is functionally absent in the microgravity environment of the ISS. This allows scientists to study underlying causes of fluid motion (such as diffusion and viscosity) that are overshadowed by buoyancy in ground studies. Beyond the value of these studies for advancing fundamental understanding of fluid physics, they may be critical to improving formulation chemistry for pharmaceuticals, improving nanofluidics technologies for medical devices, and enabling new water and energy conservation solutions associated with water droplet formation breakthroughs and enhanced energy generation, transfer, and storage. Complex fluid physics: Microgravity opens new doors in the study of the existence and interactions of small particles, such as molecules. Studying how particles move in the absence of buoyancy helps scientists better understand the fundamental rules that govern these particles and their interactions. For example, studying the way certain fluids move and behave in response to a magnetic field may help scientists improve design of consumer products such as brake systems, seat suspensions, and airplane landing gear. Materials science: The combined study of fluid movement and the behavior of particles within fluids helps scientists investigate the fundamental internal structure of fluids. The fluid dynamics of materials affect and reveal the properties of the solidified/crystallized final material—such as metal alloys and semiconductors. These studies enable development of novel materials and better manufacturing processes on Earth for commercial products, building materials, and electronics. Moreover, magnetic field studies on the internal structure of fluids may lead to improved design of ground structures to better withstand earthquakes. Interfacial phenomena: Effects on fluid movement also influence how substances interact—for example, at the boundary (or interface) between a liquid and a solid. Certain aspects of interactions at these liquid–solid boundaries are easier to study in microgravity. Results from the study of these boundaries are important for several processes on the ground. For example, bacteria in food-processing industries often grow at such boundaries, so understanding characteristics of these boundaries might help scientists avoid bacterial contamination of food. 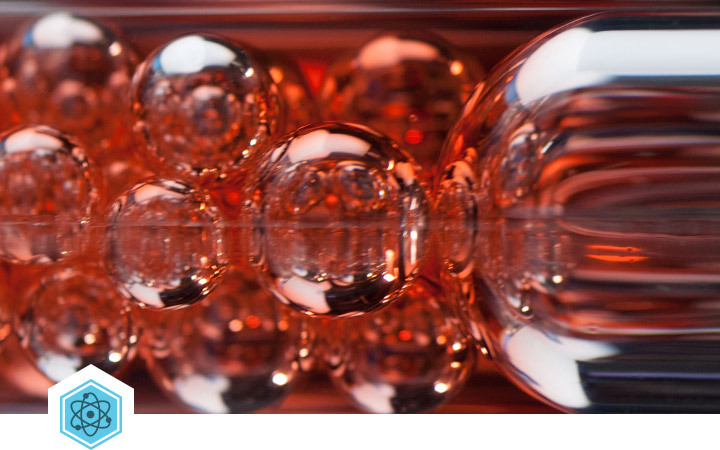 A lack of gravity-induced phase separation may also allow creation of advanced materials and alloys. Combustion: Microgravity affects important aspects of combustion such as flame ignition, propagation and quenching. 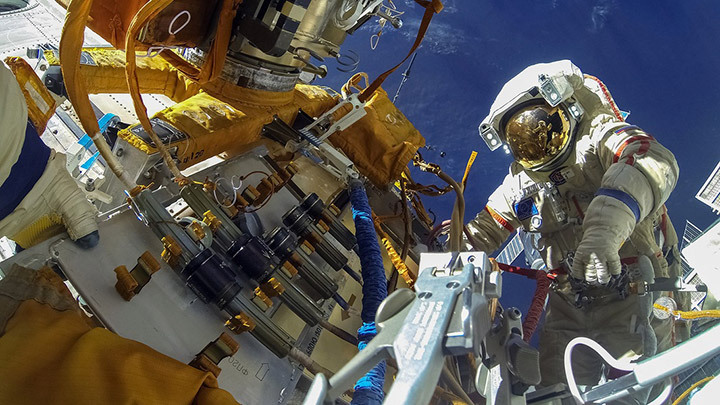 Certain types of combustion studies performed in space are nearly impossible on the ground. Resulting insight into fundamental aspects of combustion phenomena (e.g., flame structures, soot formation, and droplet combustion) can be used to develop methods to increase efficiency in ground use of combustion processes (including power generation and propulsion) and improve fire safety and environmental impacts of combustion. In-orbit production: The reduced fluid movement onboard the ISS National Lab also allows the creation of commercially relevant materials, such as optical fibers. Eliminating gravity reduces or eliminates imperfections in crystal lattices, improving transmission capabilities of the fibers and promising broad applications across multiple industries. Microgravity-enabled material production capabilities as well as additive and advanced manufacturing facilities onboard the ISS are already demonstrating scientific and commercial merit for Earth benefit. Materials testing: In addition to the benefits of microgravity, exposure to the extreme conditions of space outside the ISS—high and ultra-high vacuum, super-high-temperature synthesis (up to 3,000 K), temperature cycling, atomic oxygen, and high-energy radiation—make the ISS National Lab an ideal platform for developing, testing, and optimizing new materials (at reduced development costs). Accelerated degradation testing of materials using the extreme conditions of space significantly decreases time to market for end products such as satellite components. Across the board, materials scientists achieve cleaner results from spaceflight experiments because ground studies are commonly compromised by trace molecular species or hampered by operating temperature limitations. A major provider of household products has used spaceflight experiments to reveal unexpected results about the microscopic behavior of complex fluids, with implications for the shelf life of commercial products such as shampoo and detergent. A startup biotech company has examined how its synthetic muscle products stand up to the extremely hostile radiation environment outside the ISS, toward the advancement of realistic prosthetics and humanlike robotics. A major manufacturing company has examined flame propagation and charring of textiles in microgravity to improve flame-resistant fabrics worn by military personnel, electrical workers, and firefighters. A medical research institute has used microgravity to improve the nanofluidics technology in a remotely controlled drug delivery implant capable of advancing precision medicine. A major pharmaceutical company has studied the role of microgravity on dissolution rates of pharmaceutical ingredients, which could lead to improved control over the rates at which drugs are absorbed by the body. An academic research university is improving the cost effectiveness and energy efficiency of new solar cell materials via space-based materials testing. A space industry company has tested how exposure to the space environment affects a radiation-tolerant computer design, which may improve next-generation satellite capabilities. The ISS National Lab and the National Science Foundation co-sponsored a workshop focusing on how the unique environment of low Earth orbit, including microgravity and extreme environmental conditions, enables materials R&D that is impractical or not possible to perform on Earth. This researcher’s guide mini-book is intended to help potential researchers plan experiments that would be exposed to the space environment, while externally attached to or deployed from the ISS. This researcher’s guide is intended to help potential ISS fluid physics researchers plan experiments utilizing the microgravity environment in order to understand how heat and mass transfer affects fluid flows and behavior.